Is Value Village/Savers the Trump Foundation of Second-Hand Stores? The expensive dresser you gave Value Village or Savers may bring two cents to charity—if you’re lucky. A message repeated over and over from a network of public offices can’t help but bleed into donor consciousness. Still, the warnings from regulators are legitimate, so what is the sector to do? Let’s always look beyond the hype to self-interest and try not to fall for a load of turnips. A multimillion-dollar fake charity bingo scam results in federal charges against seven people and another PR problem for real nonprofits. A new book explores philanthropy’s role in education policy debates and aims to open broader discussion about philanthropy’s role in a democracy. 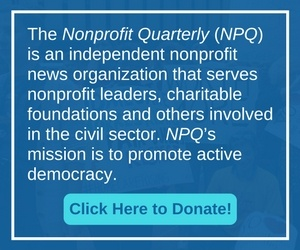 Some of your nonprofit colleagues are taking to the print media to correct the consistent misapprehensions of nonprofits foisted on the public. So should you!